The Texas Historical Commission (THC) in conjunction with the Historic Victory Grill will dedicate an Official Texas Historical Marker commemorating the historical significance of the Victory Grill after World War II. 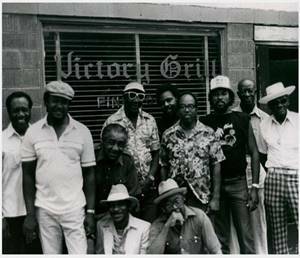 The marker dedication ceremony will feature the family of Victory Grill’s original owner Johnny Holmes, city and THC officials. THC Executive Director Mark Wolfe will give remarks at the event on Saturday, Feb. 20 at 10:30 a.m. The Hoblitzelle Foundation of Dallas funded the marker, which is the 20th in an overall series of special historical markers throughout the state entitled Vignettes of Wartime Texas. Part of the THC’s Texas in World War II initiative, these markers tell the real stories of the state’s involvement in the war effort. Speakers at the ceremony will include, the Johnny Holmes Family, the Honorable Sheryl Cole, Austin City Council, Place 6, the Travis County Historical Commission, THC Commissoners, and THC Executive Director Mark Wolfe. The public is invited to attend the ceremony. honor and preserve the memories of Texans who served in the armed forces during World War II and the significant contribution Texans made to the war effort. Historical markers, a special commemorative brochure, oral history training workshops and a statewide military/home front sites survey are part of this special program that is enriching lives through history. During World War II, segregation prevented African American servicemen from enjoying most civilian restaurants and recreational facilities. In an effort to address this issue, Austin civic leaders urged the city to provide recreational sites for servicemen on leave from military posts. By war’s end, African American servicemen had added but limited “R&R” sites in Austin. Johnny Holmes responded to this need when he opened the original Victory Grill on VJ day (Victory over Japan Day, Aug. 16, 1945) in a converted icehouse on east 11th street. Holmes created a venue in east Austin that provided returning African American servicemen with both an accessible dining establishment and blues and jazz entertainment. photo courtesy of Texas Music Museum, Photo by Tary Owens.